Not many 26 year old young men are unanimously decried globally by the world’s media as a – ‘fool hardy adventurer’ ‘an arrogant evangelical’ ‘a tyrannical colonialist’ ‘an international law-breaker’ within hours of their death. But John Allen Chau was after he was tragically murdered by a Sentinelese islander on November 17th 2018. ¶ “Blessed are you when people hate you and when they exclude you and revile you and spurn your name as evil, on account of the Son of Man! 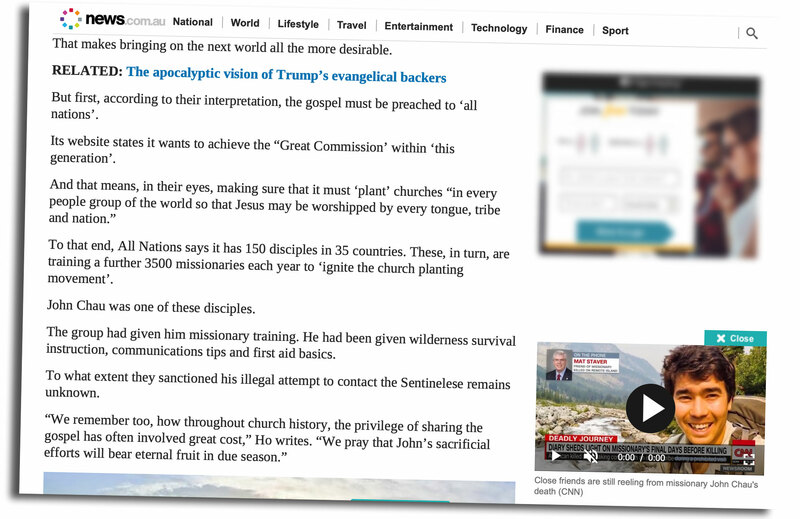 In this increasingly hostile-toward-Christianity-world it’s understandable that the unregenerate do not appreciate why a young man, who from the age of about 12 (when he first heard about the unreached Sentinel Islander people) wanted to be a missionary to the Sentinel Island which is in the Bay of Bengal off the coast of India. But when those who should know better, those who profess faith in the God of the Bible, and trust Jesus of Nazareth as the Lord and Saviour, also denounce such missionary endeavours, the disappointment is overwhelming! The follower of Christ who does nothing about the eternal plight of the lost can not truly claim to be following Christ! Christ’s “mission” was to “seek (out) and save the lost” (Luke 19:10 ). If anyone follows after Christ they are walking in the footsteps of a missionary Saviour! The original disciples of Christ each heard the beckoning resurrected Christ summon them to go as missionaries (Matt. 28:19-20 ). Each of them paid a high price to follow Christ. Thomas went to India, and died a cruel martyr’s death. Andrew preached in Turkey, Russia, and Greece where he was eventually crucified. Philip preached in Egypt and was executed by the Roman Proconsul there. Matthew preached in Ethiopia where was eventually stabbed to death. James, the son of Alpheus, was stoned to death. Peter was crucified upside down. Paul was beheaded. 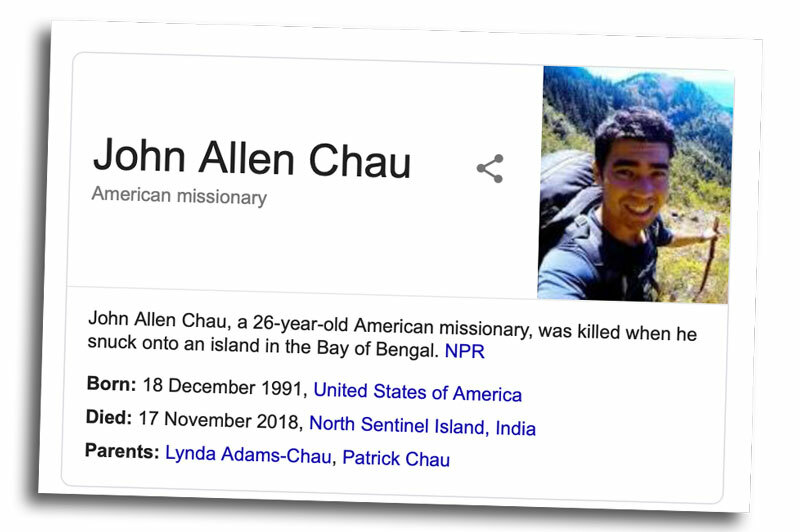 While John Allen Chau has attracted global media attention as if he is something unusual, the fact is that more Christians are being martyred today than at any other time in history! ¶ Let no one deceive himself. If anyone among you thinks that he is wise in this age, let him become a fool that he may become wise. The New Testament teaches us that when we try to please the world by compromising what Christ expects of us, we then become true fools. Some of the criticisms which John Chau received were completely misinformed and flat-out wrong. 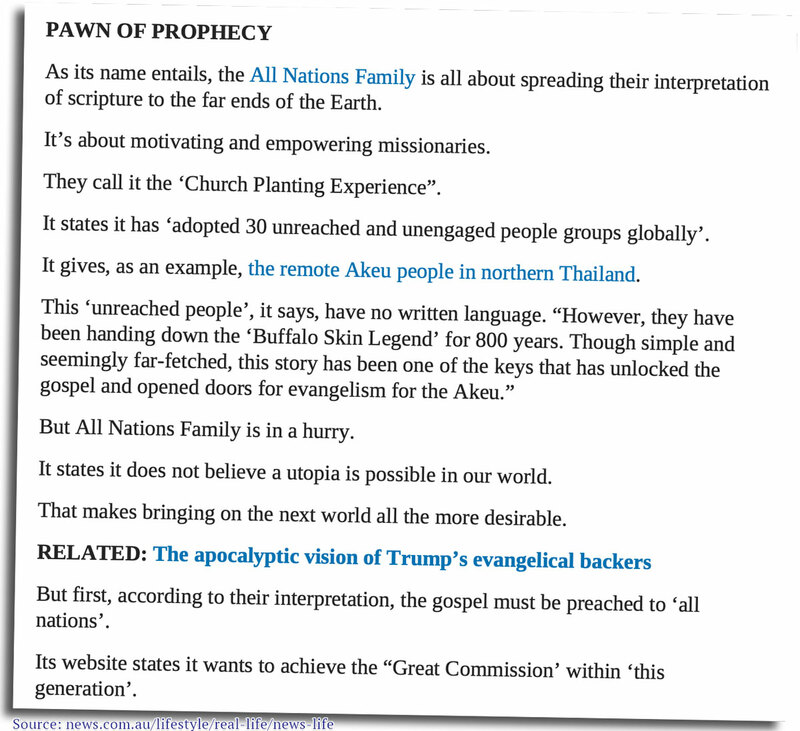 Someone who knew him, Matt Staver, has written a piece for Charisma Magazine called, The Truth About John Allen Chau. He counters much of this mis-information peddled by the mainstream media about Mr. Chau. It turns out that John Allen Chau was relatively highly trained as a missionary in linguistics, survival skills, social interaction, and emergency medicine. Far from being illegally on this island, he had every right to be there under current Indian law. But the way the world has responded to this episode is very revealing for where we are now at as a Western culture. One of the points that missiologist Justin Long makes about the number of martyrs today is about the number of Christians alive today. While more Christians have been martyred in the last century than the previous twenty centuries combined, he reminds readers that this also has to do with sheer number of Christians alive today as well. Christianity is growing exponentially in many parts of the world. There are more muslims converting to Christianity today than at any other time as well. In some parts of the world, the conversion rate of people becoming Christians is out-performing the birth-rate! Even in Australia, where many Christians have considered the average Aussies too hard for Christianity to ever grip them, we are seeing churches of extraordinary sizes growing around our nation. Most people know of Hillsong and its Sydney congregation of 30,000 members, but there are other significant churches in each major city of Australia such as the 20,000 member Planet Shakers church in Melbourne, the 12,000 member Crossroads church in Burwood, Margaret Court’s church of thousands in Perth, and of course our own in Legana, Tasmania. But despite this, as Dorothy from the Wizard of Oz said to her pet dog, “Toto, I don’t think we’re in Kansas anymore!” No Dorothy, I think we’re in Babylon! ¶ “Blessed are you when others revile you and persecute you and utter all kinds of evil against you falsely on my account. We currently have some extraordinary privileges as Christians. We can openly share our faith in Christ as the Saviour without fear of criminal charges. This is not the case in many parts of the world! We can publicly hold gathering whereby we invite people to hear and receive the Saviour and His message. This is not the case in many parts of the world! We currently enjoy tax-exempt status as a church which enables us to be able function on a shoe-string budget. We have access to Christian media outlets with whom we can broadcast our messages to tens of thousands of listeners across northern Tasmania and potentially hundreds of thousands around the world via Soundcloud. I believe God has ordained all of this at this precise time, and brought you and I together also at this precise time, for such a time as this! Rather than seeing John Allen Chau as a reckless fool, we should honour him as a martyr who sincerely cared about seeing people from every tribe, nation, and tongue brought to Christ. And so should we!! In fact, over these next two weeks we have some enormous advantages which can improve our chances of seeing someone we invite accept our invitation to come to a church event (Children’s Christmas Play – this Sunday, Carols By Candle Light – next Friday, our Carols Sunday on December 16th, and our 9AM Christmas Day Service). In addition to this there is BBQ/hospitality outreach that we can each engage freely in (either as a host or guest). Let’s take advantage of the freedoms and privileges that we all currently have and not give God any reason to decide we now longer deserve them!